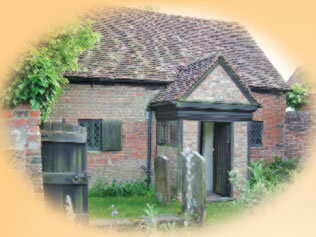 Keach's Meeting House was built in 1695, on land belonging to William Gyles, a prominent Winslow businessman. A small rectangular structure, with walls of red brick in Flemish bond, and a tiled roof gabled to East and West. The North front has two small rectangular windows with leaded glazing and external shutters; between them is a timber framed porch, which was mostly renewed c1958. The interior has been altered at various dates. A gallery was built at the East end in 1827 to accommodate the influx of Independent seceders. The Meeting house contains a 17th century communion table and several monuments and floor slabs. The pulpit, centrally placed along the West wall, is surrounded by box pews, and open backed benches – not very comfortable for long sermons! 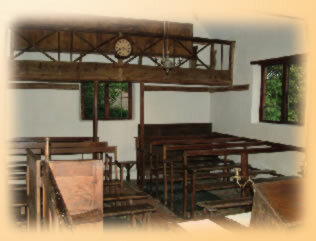 Against the East wall there are desks with hinged tops and four lead inkwells, for the use of the Sunday School which was commenced in 1824. A small burial ground on the north side of the meeting house is surrounded by a brick boundary wall. Information taken from Non-conformist Chapels and Meeting Houses – Buckinghamshire by Christopher Stell, published by HMSO 1986.